This recipe is also kid approved — it is my daughter’s favorite dish hands down, and pretty much the only spicy thing she’ll eat without saying a peep. Every time she comes with me to the grocery store and I ask what she wants for dinner, she immediately says “Chile con carne!” For her birthday, that’s what she’s having for lunch. Last night I also gave my 9 month-old a couple of tablespoons to try, and he ate the entire portion! Protein and fiber packed meal in a pot. Accompany with rice. Heat the oil in a heavy pot under medium heat. Once it is hot, add the chopped onion and cook for about 2-3 minutes. Add the meat and cook thoroughly. Sprinkle the salt while it cooks. Once the meat is cooked, add the chili powder, cumin, paprika, cardamom and pepper, and mix well, cooking for 2 minutes. Add the roasted tomatoes and the two cans of beans, liquid included. Bring to a boil and then lower the flame to let is simmer for 25 minutes, uncovered. Once the liquid has reduced, check for salt and pepper, then cover. You can either let it cook longer at a very low heat, or serve right away. Enjoy! You can also do this dish in a slow cooker. Cook the onion and beef as directed, then add the spices and take the pot off the heat. Place in a slow cooker and add tomatoes and beans with their juices. Cook in high heat for 3 hours, or on low heat for 6-8. Tagged Gestational Diabetes, Mexican cooking. Que riquisimo, ya me dio hambre! Muchísimo gusto en conocerte también! Nos tuvimos que ir corriendo, porque mi marido me dijo que mi hija estaba con mucha fiebre y sintiéndose mal 🙁 Ya seguiré poniendo recetas! Busca en la sección de niños los scones de moras — son deliciosos y super fáciles de hacer con los niños! 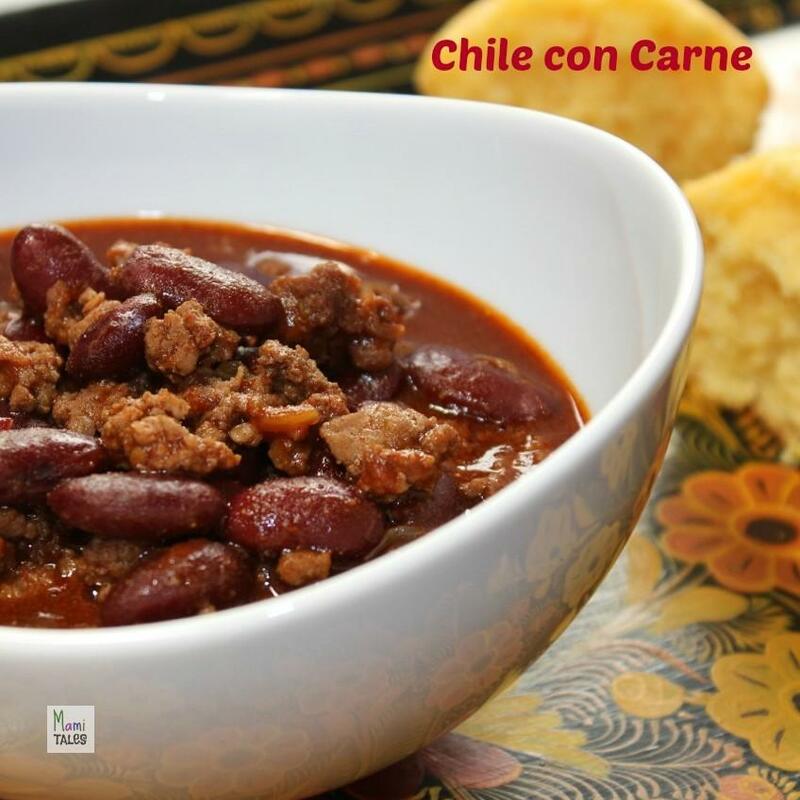 It’s been a while since I had chilli con carne and I have to admit I miss it! I like that you used roasted tomatoes. It must’ve been amazing! Thank you! Roasted tomatoes with the green chili are super yummy… it gives the chili a particular sweet taste to contrast the spiciness. I also love the little bit of cardamom in it.